Some people like to have control over their family even in the afterlife. A father (Pierre Curzi) decides to state in his will that his $5 million inheritance must be divided among his widow and four children “according to individual need.” At a family barbeque, sitting around a pig on a spit, all manner of past disagreements and grievances are aired. Christian Bégin’s play raises tough questions for these characters as they grapple with how to determine “need” while remaining civil. 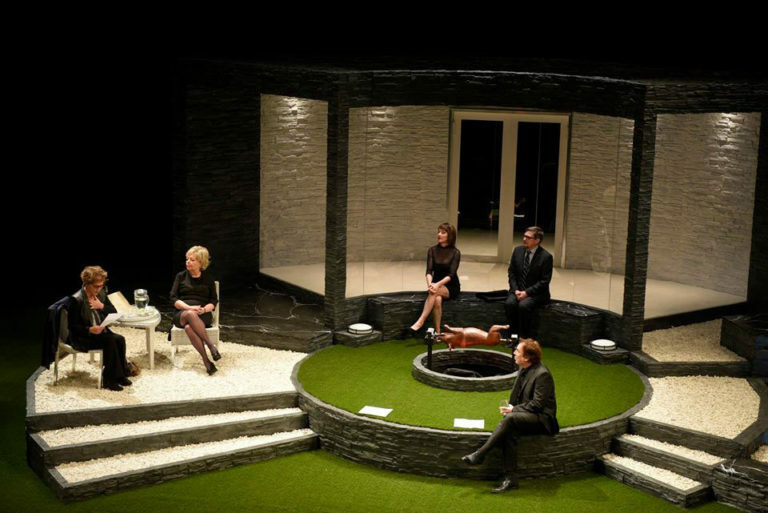 Indirectly referencing power, politics, individualism, and various ideological positions, the play is tightly written and full of deeper meaning. Things gradually spiral out of control and the darkly humorous exchanges are delivered with razor sharp wit by Christian Bégin, Marie Charlebois, Sophie Clément, Pier Paquette, Isabelle Vincent. One son, Guillaume, has flashbacks of a conversation with his father, and this is shared bit by bit as the play progresses. These interactions reveal a great deal about the father’s character and add to the depth of the narrative. Guillaume has recently returned from Nigeria where the nature of his work was questionable; Roger, fastidious and efficient to a fault, has made a detailed agenda for the gathering; Manon finds the situation emotionally overwhelming, and France is bored with the whole affair. Along with their mother who is in denial about her husband’s questionable actions and hazy morals, their personalities make for a very entertaining combination.